"Dumb and Dumber To" stars Jim Carrey and Jeff Daniels in a sequel to their first "Dumb and Dumber" movie two decades earlier. Darien News film critic Susan Granger reviews the new movie, "Dumb and Dumber To:"
More and more, Hollywood is looking back to its future. Understand that there's a fine line between a reboot -- which is a new take on an old concept -- and a sequel. Since the original twosome is back and this story picks up after the 1994 original, it's a sequel. As it begins, Harry Dunne (Jeff Daniels) desperately needs a donor for a kidney transplant. When he finds a 23-year-old postcard from an old flame, Fraida Felcher (Kathleen Turner), informing him that she's pregnant with his child, Harry and his buddy Lloyd Christmas (Jim Carrey) discover that Fraida gave the baby girl up for adoption, but she shows them a recent photo of Penny (Rachel Melvin), a smokin' hot babe. Lloyd convinces Harry to try to find Penny, ostensibly to donate a kidney but also because he's smitten with the way she looks: "She's fruit of the loom." What the perennial pranksters don't know is that someone else is also searching for Penny, a killer (Rob Riggle) who's in cahoots with Penny's scheming stepmom (Laurie Holden), who is slowly poisoning Penny's wealthy adoptive father, a Nobel Prize-winning scientist (Steve Tom). After "Dumb and Dumberer: When Harry Met Lloyd" (2003) flopped, directors Peter and Bobby Farrelly ("There's Something About Mary," "Three Stooges") realized that their franchise really depended on re-igniting the imbecilic chemistry between Jim Carrey and Jeff Daniels, even though 20 years has passed. Despite (or perhaps because of) input from six credited screenwriters, it's ironic that the actors seem to be having more fun with the moronic, mistaken identity slapstick than the audience. Blind jokes and fart jokes abound, along with pee and poop jokes. Instead, catch Jeff Daniels as the anchorman on TV's "The Newsroom." And, if you really want funny, go to YouTube and watch Jim Carrey mock Matthew McConaughey's Lincoln commercials on the Halloween edition of "Saturday Night Live." 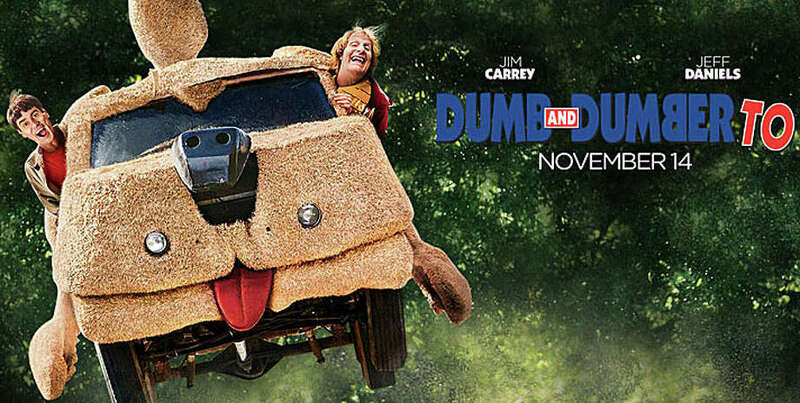 On the Granger Movie Gauge of 1 to 10, "Dumb and Dumber To" is a disappointing, tedious 2, ineptly trying to reprise the vulgarity and sophomoric humor.